Although it was a scorching hot day, fall fashion was on display at the Park & Bark Dog Show, this past weekend in Toronto. The Park & Bark Dog Show is a place to socialize, make new friends and get plenty of reliable information on all things dogs. With many local vendors, pet owners are bound to find something useful and have a great time. Each vendor has something different to offer, from information, to free samples, and products to purchase right on the spot. The best thing is, the event is free. The whole family is welcome to attend as long as your dog is on a leash. Park & Bark is just over a year old, and Lyle Goodis, organizer of Park & Bark, says that this all started because he has a strong love for dogs. He believes all dogs are therapy dogs and he sees the joy that they bring people. Park & Bark entrance sign. 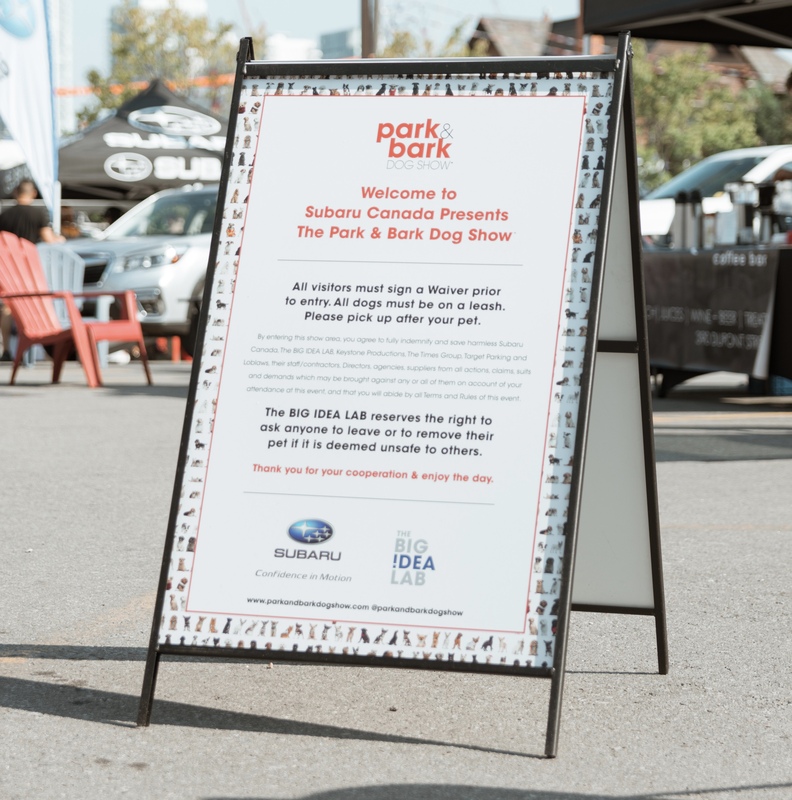 You can find Park & Bark shows in outdoor areas around the GTA, rather than at large indoor pet shows. Goodis says there is a reason for this. “I want to be different. I’m trying to keep it neighbourhood. A lot of people are really big these days on small is good,” he says. Goodis is the creator of The Big Idea Lab, and Park & Bark was one of his “big ideas”. He plans to grow Park & Bark to reach more dogs in new locations. Salis Sweaters, a clothing company for dogs, was at the Dog Show this past weekend showing off their alpaca sweaters. Salis Sweaters is a year old and they are known for their unique style of sweaters that have a zipper on the top, making it easy to put on your dog. Sandra Hyde, co-owner of Salis Sweaters says that the new style has been a great attraction and selling point. “Sweaters are boring, so I’m quite proud to say we have something new. I’ve never seen a zipper in the top,” she says. Their colourful handmade designs make them different and a lot of fun for dogs to wear. The sweaters suited for smaller dogs, made from alpaca and wool making them perfect for those cold nights. There will be two more Park & Bark Dog Shows happening in the next few weeks, if you did not get a chance to attend last weekend. Oct. 6 at 429 Roncesvalles Ave. If you can’t make it to any of the shows, you can visit dogto.ca, an online forum, and directory for dog products and services catered to the GTA. Megan is a second-year journalism student at Sheridan College. She is passionate about lifestyle, beauty, and fashion.